Home > General Comment	> Stateless society and the uprising in Egypt. 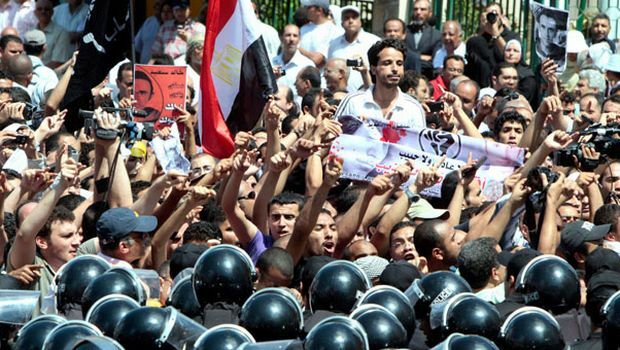 Stateless society and the uprising in Egypt. Can the events in Tunisia and Egypt reshape the way libertarians, anarchists and communists think both about a stateless society and how this stateless society can emerge? The popular uprising, somewhat discredited as a means of achieving a stateless society until recently, appears to be in vogue again. What makes it of particular interest to me is that the uprising is itself a voluntary cooperative act by members of society against an intolerable state machine. It doesn’t take much curiosity to wonder if this voluntary association can do more than simply challenge the existing order. Can it replace the existing order as was attempted with the Paris Commune? I have been reading the French philosopher Alain Badiou’s recent talk “Alain Badiou on Tunisia, riots & revolution”. As usual, this monumental thinker clarifies a lot of things in my opinion. Just reading his talk aided my own understanding of the Egyptian uprising going on now. The power of the uprising, Badiou argues, “is essentially negative (‘make it go away’)” All uprisings are acts of despair and desperation and this desperate act is a striking out against, and throwing off of, the intolerable burden of the existing State. The Western press has already responded by saying that what was expressed there was a Western desire. What we can affirm is that a desire for liberty is involved and that such a desire is without debate a legitimate desire under a regime both despotic and corrupt as was that of Ben Ali. How this desire as such suggests a Western desire is very uncertain. It must be remembered that the West as a power has so far given no proof that it cares in any way whatsoever about organising liberty in the places where it intervenes. The account of the West is: “are you walking with me or not?”, giving the expression “walk with me” a signification internal to the market economy,* if necessary in collaboration with counter-revolutionary police. “Friendly countries” like Egypt or Pakistan are just as despotic and corrupt as was Tunisia under Ben Ali, but we’ve heard little expressed about it from those who have appeared, on the occasion of the Tunisian events, as ardent defenders of liberty. Without a positive conception of its aspirations the uprising will fall prey to the reconstitution of the old order that is not merely the Mubarak regime, but the empire headquartered in Washington, for which the Egyptian state is only the local outpost. The hallmarks of this reconstitution are constitutional reform, replacement of the most odious personalities, a reshuffling of the cabinet, and a promise of “free and fair elections” — what Badiou calls the “Western inclusion”. Beneath all of this reshuffling, however, the existing State continues undisturbed. If it is true that, as Marx predicted, the space where emancipatory ideas are realised is a global space (which, incidentally, wasn’t the case with the revolutions of the Twentieth Century), then the phenomena of Western inclusion cannot be part of genuine change. What would genuine change be? It would be a break with the west, a “dewesternisation”, and would take the form of an exclusion. If there were a different evolution than the evolution toward Western inclusion, what could that attest to? No formal response can be given here. We can simply say there is nothing expected from the analysis of the state’s process which, through long and torturous necessity, will eventually result in elections. What is required is an patient and careful inquiry among the people, in search of that which, after an inevitable process of division … will be carried by a fraction of the movement, namely: statements. What is stated can by no means be resolved within Western inclusion. If they are there, these statements, they will be easily recognisable. It is under the condition of these new statements that the development of the organisation of figures of collective action can be conceived. In his inquiry Badiou poses the alternative affirmation as an essentially negative act: “an exclusion” or break with the West. It is expressed in the form of a declaration of intention by the uprising that is fundamentally incompatible with the existing order — with globalization and empire itself. However, so far as I can tell, the uprising in Egypt is this negative act of exclusion already. By challenging the legitimacy of the Mubarak regime the uprising called into question the entirety of relations of which Mubarak and his henchmen are only the local expression. Confirmation of my conclusion can be seen simply by reviewing Washington’s response to the uprising — the Obama administration certainly believes that its fundamental interest are at risk. What Badiou demonstrates, therefore, is that the uprising must become aware of itself as an active challenge to “the West” — to globalization and empire. To become more than a mere riot, the uprising must recognize that it is the first act of a voluntary association — the first act by which this voluntary association establishes itself as a new basis for society. Badiou demonstrates that it is not a question of organization, but a question of consciousness on a mass scale that is wanting. The question we all have to ask ourselves at this point is simple: What separates the uprising of January 25 from the Paris Commune? In the case of the Paris Commune, the uprising recognized itself as the solution to the intolerable burden of the State. It did not merely sweep away the existing order, but set about to manage society itself in voluntary association. It invited the rest of France to join with it. Every local uprising like January 25 should aspire to become a non-local event – to declare itself as the new basis of social organization and to appeal to the oppressed of the world to join with it. The call for a transitional government, constitutional reform, new elections, etc., should be rejected. The January 25 uprising must avoid being defined as something of significance only to Egypt; it cannot win if it is confined to Egypt — it must strip off its national form. In response to the secret negotiations directed by Washington, the January 25 uprising will have to aggressively declare its intentions to go global. If the January 25 movement does not acquire a consciousness of its own global significance it will be isolated and suppressed. It has to aspire to more than changing local personalities and declare that the empire, headed by Washington, is the enemy. What is truly revolutionary in the uprising in Egypt is that it can become a universal event, spreading beyond Egypt – a general rising of the oppressed. To do this, the uprising will have to reject every attempt both to confine it to Egypt and pacify it with minor changes in the existing State. The target is Washington and its empire; the aim is to replace this empire with the voluntary association of individuals. The way to turn this into a stateless revolution would be for the demonstrators to stop demonstrating. Don’t spend your days holding signs in Tahrir Square making demands. Go back to your homes and businesses and start living your lives – but do so with the same convictions that you hold while you are demonstrating. The Egyptian state is at a standstill and powerless while the populace is demonstrating in the streets. By why must that only hold true while people are marching? If that same number of people is at home raising their children; tending to crops; repairing cars; doctoring illnesses – but doing all that while still telling the state “we will no longer obey you”, then how can that be any less powerful? If that same populace goes back to their lives while simultaneously withholding their support of the regime, they will have achieved something that no one has before. Since I don’t want to put words in your mouth, how would what you are suggesting differ from a call for apathy? What I’m trying to describe is merely civil disobedience. It is as anarchists have pointed out many times: the state relies on your consent. If enough people withdraw their consent, the state will wither. Apathy is doing nothing and/or not caring. Apathy is the situation that existed prior to the demonstrations. Apathy implies acquiescence. I suppose what I’m trying to say is to develop a counter-economy. Develop mutually beneficial institutions that don’t require the state and withdraw yourself from those institutions that do require the state. Disobey the rules that create artificial scarcity and rents – things like licensing. If you are a doctor and your professional governing body requires you to follow arbitrary guidelines meant to solidify their own position – ignore them and practice medicine in the way most beneficial to you and your patients. If a law says you can’t sell or trade food you make in your own kitchen – disobey it. If a law says you must pay X tax on transactions – do business with like-minded people who all agree not to worry about the taxing authority. Obviously this will only work if there is large-scale buy-in, which is why I think if we got everyone currently demonstrating in the streets to follow that path, it could take hold. Is it doable? I think so, though I’m not saying it is an easy thing to come by. If it were easy, it would have been done by now. One problem with your idea, it seems to me, is that the kind of mass alteration in consciousness required for it to work can only be developed in the course of trying to pull down the existing order. I am not sure how mass civil disobedience arises without this. Can you respond to this observation? Perhaps. It certainly is a sensible next step of such a revolution, though I think it could develop independently from a desire to overthrow any particular order. Education is key to that. Anarchism, or a stateless society is an idea, and as such must be disseminated for it to be effective. I think your concerns are right; that such an idea has not been germinating among the Egyptian people but rather an idea of removing the current regime. That said, we do have a situation closer to being able to implement that notion than any I can recall in recent times. In this case – currently – we have an existing order that has in fact been pulled down. Mubarak the man has resigned. Yet the state itself endures. Continued demonstrating in public squares is unlikely to bring about the end of the entire institution. Perhaps you are correct in that the mass civil disobedience must follow rather than lead. But in that case I think we are now at the point that it must follow if this revolution is to continue. If the only outcome of this is that Mubarak is replaced and the people are placated, then they’ve accomplished little more than what Mubarak’s own death would have caused (and he is almost 83 years old as it is). If I turn to look here in the US, removing the current head of state through popular revolt would have no greater impact than electing a new one. If a new society is to come about, I don’t think it can happen simply by removing the current order. But, I am neither an anarchist theorist nor a strategist and I think I’m near the end of my ability to engage in any meaningful debate on this topic. It seems to me that a number of avenues still need attention from society that will not come simply by returning to their homes: investigations need to be made into the army, the foreign ministry, the security apparatuses, the prisons, the role Mubarak played in Gaza, and the NDP itself. If anything, creating a stateless society must mean that no part of the existing regime should escape supervision by the people as a whole. More than simple civil disobedience is called for now, the population must begin to manage society on its own behalf. I’m really completely happy about everything that developed in Egypt. Ultimately, the tyranny of Hosni Mubarak has come to an conclusion. And the whole thing took place mainly because of the bravery of the egyptians. I hope that the example will broaden through all the Middle East. Liberty now! Peace. To the poster who talked about the Tea Party agenda, as if everybody agreed it was a threat, please consider this viewpoint. And about 10 more from different angles. Threecrow: And their children and grandchildren will love them and honor them Can government be reduced without limiting hours of Labor?